This month I wrote two short essays for The Aperiodical‘s Big Internet MathOff: “The Mystery of the Vanishing Rope Trick” and “Cantor’s Paradise Meets Skolem’s Paradox”. Whittling an essay down to a thousand words is hard but it’s good exercise! Have you ever done something impossible? About twenty-five years ago I invented an impossible rope trick by accident, and afterwards I could never figure out what I’d done or get the trick to work again. It wasn’t the rope that had vanished, but the trick itself. The incident took place at a math conference in Amherst, Massachusetts, and no, I hadn’t been drinking, though I admit that it was late at night and I was tired. The trick consisted of forming two simple overhand knots on a rope, one right-handed and one left-handed, and passing one of them through the other in such a way as to cause the knots to cancel, leaving a simple unknotted rope. Sounds natural, right? Except that math says that this can’t happen. And ironically it was in trying to show another conference participant that it can’t happen that I accidentally stumbled across a “demonstration” that it can. Of course, when I say “math says”, what I mean is “mathematicians say” — mathematicians like John Conway, who (regardless of who wins this “world’s-most-interesting-mathematician” contest) is The World’s Most Interesting Mathematician; just read his biography, “Genius at Play” by Siobhan Roberts, if you don’t believe me. When Conway was still in high school, he found a beautiful way to prove that two knots on a rope can never cancel each other. I learned about Conway’s proof via Martin Gardner’s “Doughnuts: Linked and Knotted” (see the References). Conway’s argument is a proof by contradiction; I’ll abridge Gardner’s explanation a bit. Suppose we have a rope with two overhand knots tied in it, called A and B, and we attach the two ends of the rope to opposite walls of a room. Imagine that the ends of the rope continue out two windows and join up again over the roof of the house, as in panel 1 of the picture below (taken from Gardner’s article). Imagine a sheath around the rope that swallows one knot (A) and follows the other (B), as in panel 2; the sheath, like the rope, goes out both windows, and the two ends of the sheath join over the roof. Notice that the sheath is knotted, with a single overhand knot. The upshot is, two overhand knots can’t cancel each other. But that leaves us with the question, what exactly happened twenty-plus years ago when I got two overhand knots to cancel? So, what do we have here? A contradiction in mathematics? Maybe it’s something humbler but still astonishing: a proof that a single overhand knot in a closed loop actually can be removed from the knot without performing any cutting. After all, Conway’s proof hinges on the assertion that a sheath that’s knotted at the beginning of the process must still be knotted at the end. Obviously the technological implications of a way to remove knots from a closed loop without cutting it open would be world-changing. Kauffman claims that his demonstration makes use of Rupert Sheldrake’s morphogenetic field, but surely a more parsimonious explanation is that Kauffman pushes the rope into the fourth dimension when we’re not looking, right? Next month (August 17): Knots and Narnias. C. S. Lewis asked: What if there were portals between worlds? Bill Thurston asked: What if those portals could have knotted boundaries? Short answer: You get more Narnias! Thanks to John Baez, Sandi Gubin, Lou Kauffman, Scott Kim and Andy Latto. #1. I’m pretty sure that Kauffman’s trick isn’t the maneuver I accidentally invented in Amherst, so I deserve zero credit for inventing his trick. Come to think of it, I don’t deserve credit for inventing “my” trick either. With very few exceptions (like Fermat), the mathematical community rightly honors the people who share their discoveries, not the people who claim to have made discoveries but don’t give the details, saying “I don’t have room” or “I forgot”. #2. I put in the references to morphogenetic fields and higher dimensions as a sly hint that I was being facetious in my description of Kauffman’s trick, but judging from the responses I’ve gotten, I see that I was being too subtle. It’s a joke! But all kidding aside, the most likely explanation for what happened to me in Amherst is that I misdirected my attention somehow. If I could learn to misdirect other people’s attention in the same way, I’d have a pretty cool trick! Martin Gardner, “Doughnuts: Linked and Knotted”. See Chapter 5 in Gardner’s book “Knotted Doughnuts and Other Mathematical Entertainments” or Chapter 20 in “The Colossal Book of Mathematics”. 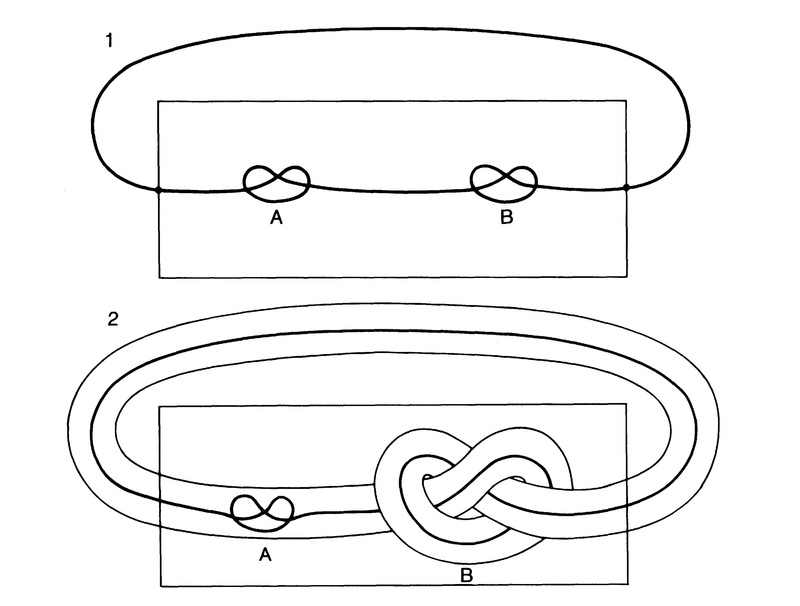 Louis Kauffman, “Knot Logic”. A three-page excerpt that explains Conway’s argument is posted on the Mathematical Enchantments website, with Kauffman’s permission. Louis Kauffman has made a number of YouTube videos of knot tricks. I already included links to Kauffman’s (K)not Cancellation and Collapse (marked “KnotAnomaly” above) and WhiteFigureEight1073. Kauffman and Allison Henrich are writing a book on Rope Magic and Topology. In the meantime, you might also enjoy Chefalo Rope Trick and Chefalo Rope Trick and Ring Drop. Also, if you ever find yourself in a time-loop (as in the movie Groundhog Day), and need a way to pass the same hours over and over again, don’t train yourself to throw cards into a hat the way Bill Murray’s character does; instead, train yourself to throw a knot in a rope! Bri Crabtree can do it; you can too. Siobhan Roberts, Genius at Play: The Curious Mind of John Horton Conway. Bloomsbury, 2015. How many real numbers are there? If you only know Cantor’s answer but not Skolem’s, then you don’t know the full story. And if you don’t know Cantor’s answer, that’s okay; I’ll begin with that. Georg Cantor was a 19th century mathematician, and I like to think that in some parallel universe, on a planet sort of like 19th century Earth, only nerdier, there’s a version of Cantor who gets his kicks winning people’s money on a two-part bar-bet, despite the ever-present risk of getting beaten up. When parallel-universe-Cantor (call him “George”) meets a stranger (call him “Leo”) in a bar, and they start talking math (as people on that planet do), George describes two sets that pictorially seem to be different sizes: on the one hand, the integers, each with its own parcel of real-line real estate; on the other hand, all the other rational numbers, ignominiously crammed into the spaces in between. George bets Leo that there’s a one-to-one correspondence between the two sets. Cartoon by Ben Orlin. Check him out at https://mathwithbaddrawings.com . Now this seems flat-out ridiculous, so Leo accepts the bet, and is stunned when George shows him just such a one-to-one correspondence. (There are many ways to do the job; Endnote #1 describes the silliest one I know.) Leo grudgingly pays George half of his money. But that was just a set-up for the real hustle. 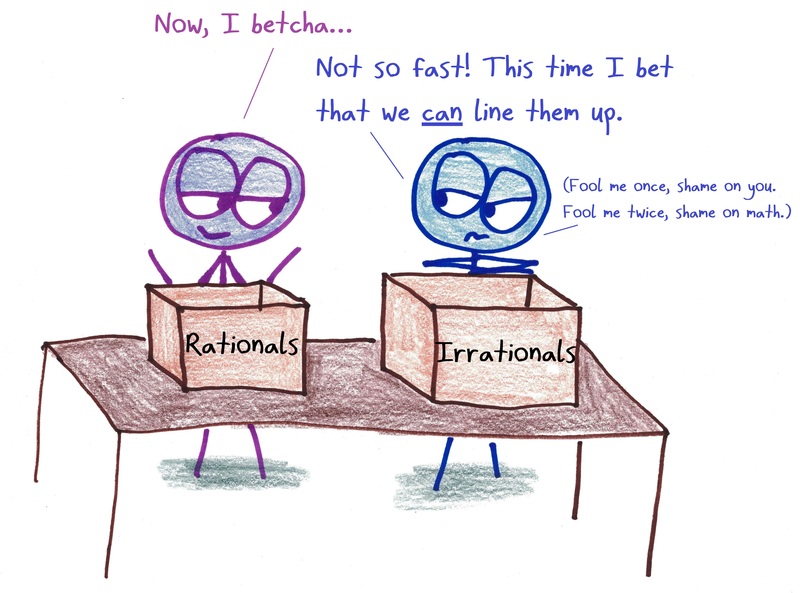 George now describes two sets that pictorially seem to be the same size: on the one hand, the rational numbers, spread all over the place; on the other hand, the irrational numbers, also spread all over the place. George bets Leo that there’s no pairing between them. Another cartoon by Ben Orlin. Follow him on Twitter @mathwithbaddrawings. Leo — having learned that sets that appear to be different sizes can be the same size, but alas not having learned to mistrust George and bar-bets in general — accepts the wager, and George gets the rest of Leo’s money (possibly followed by a back-alley bruising) by showing that there’s no possible way to pair the two sets, using a gimmick that on our planet is called Cantor’s diagonalization trick (see the References for details). Cantor used this trick to prove that some infinite sets are genuinely bigger than the set of counting numbers — sets so big we call them “uncountable”. The real numbers form one such uncountable set. Not everyone on our planet has liked Cantor’s trick. The noted mathematician Leopold Kronecker didn’t physically beat up Cantor, but he did call him a “charlatan” and a “corrupter of youth”. Fortunately, the even-more-noted mathematician David Hilbert came to Cantor’s posthumous defense, declaring “No one can expel us from the paradise that Cantor created for us,” and most mathematicians would agree. But the opponents of the notion of uncountable sets have had their own quiet sort of victory. It’s not that Cantor’s proof is wrong; instead, Cantor’s heirs have learned that Cantor’s paradise isn’t always the best place to get their work done. For one thing, Cantor’s successors have learned that Cantor’s paradise is irreducibly and frustratingly plural: some key questions, notably the Continuum Hypothesis, can’t be resolved using Cantor’s methods, and this undecideability gives rise to a fork on the road to absolute truth. Choose the left path, you enter one paradise; choose the right path, you enter another. To tame the new mathematical multiverse, mathematicians needed sharper tools, such as a more nuanced way of looking at the objects of mathematical thought (numbers, shapes, etc.) and the languages used to describe them. Yet another cartoon by Ben Orlin. Pre-order his book “Math With Bad Drawings” at your friendly local brick-and-mortar bookstore, and something wonderful will come your way in September when you need it most! Two logicians who contributed to Cantor’s framework in the post-Cantor era were Thoralf Skolem and Leopold Löwenheim. Skolem pointed out that their work had a paradoxical consequence: every logically consistent first-order theory has a model in which every set is countable — even if that theory contains Cantor’s proof of the existence of uncountable sets! What’s going on here? The notion of “countability” has undergone a subtle change in meaning. It no longer exclusively refers to the absolute size of a set; it has also become a more supple relative notion, more particularly, a relation between a set and the tools available for measuring the size of the set within a particular mathematical system. A set that in one first-order system is uncountable (because the system isn’t expressive enough to describe a way to list the set’s elements) can be countable in relation to a more expressive first-order system. Seen from the outside by someone who believes in the existence of uncountable sets, a model of mathematics that contains only countably many real numbers might seem impoverished. But consider: In any formal mathematical system that the human race ever has developed, or ever will develop, the axioms, theorems and definitions will all be strings of symbols from some finite alphabet. Consequently, even if the universe lasts forever and intelligent life continues without end, only countably many real numbers will be definable, because there are only countably many finite-length definitions of particular numbers. All other real numbers will be forever unknown. Would we miss such numbers if they vanished? Would we notice they were gone? Coming soon (September 17): A New Game with Infinity. Cantor’s way of measuring infinite sets has the feature that if you remove an element from an infinite set, the set is the same size as it was before. But Cantor’s game isn’t the only game in town. Thanks to John Baez, Sandi Gubin, Lou Kauffman, Scott Kim, Andy Latto, Gerry Myerson and Shecky Riemann. 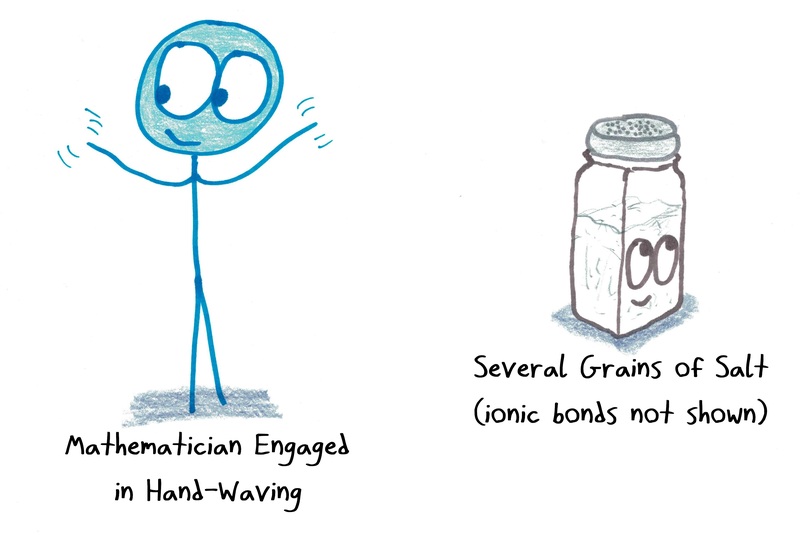 And great thanks to Ben Orlin for providing the three delightful cartoons. This list contains all the positive non-integer fractions in scrambled order. 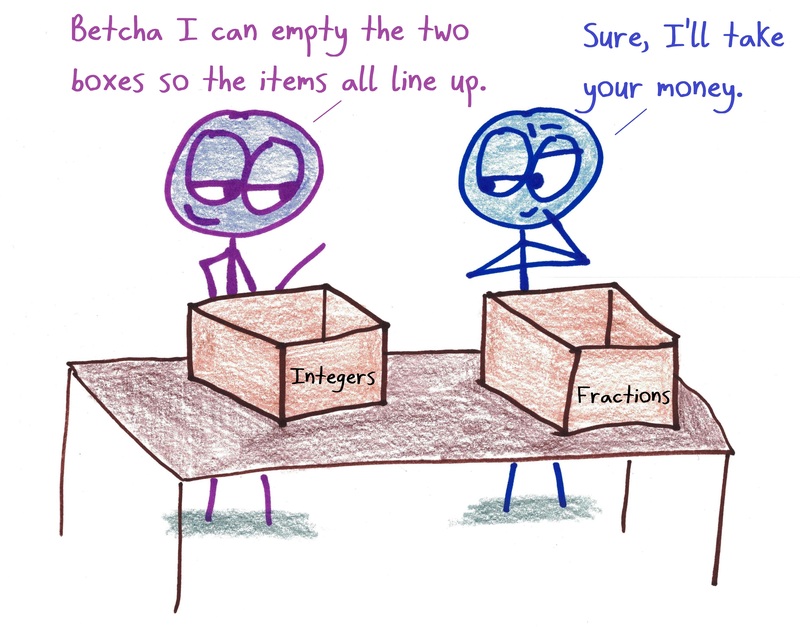 If we now pair the integer 1 with the 1st fraction on the list, the integer 2 with the 2nd fraction, and so on, we’ll get a pairing between the positive integers and the positive non-integer fractions. I’ll leave it to you to figure out how to extend this to a pairing of all the integers and all the non-integer fractions. #2. The Continuum Hypothesis asserts that c (the “number” of real numbers) equals aleph-one (the second-smallest infinity). Some people say that the undecidability of the Continuum Hypothesis tells us that we don’t really know how many real numbers there are, but one could just as well say that it tells us that we don’t really know how big aleph-one is. Martin Gardner, “Aleph-null and Aleph-one”. See Chapter 3 in Gardner’s book “Mathematical Carnival” or Chapter 25 in “The Colossal Book of Mathematics”. This entry was posted in Uncategorized on July 16, 2018 by jamespropp. Who Mourns the Tenth Heegner Number?